All of our Spa Sessions are Individually Customized and come complete with the use of blended therapeutic modalities, hot rocks, cool stones, Simple Path premium organic, botanical skin care products, 100% pure Jojoba and dōTerra therapeutic grade essential oils. Please visit our Treatments page for our complete session descriptions & pricing. Please include your contact numbers, best dates, times and any massage therapist gender preference for your sessions. A Spa for You Sedona Day Spa is proud to be consistently included among Sedona's Best Spas and Spa Experiences, to have been one of the first Sedona spas inducted into TripAdvisor's Original Hall of Fame for our Service Excellence and for having received TripAdvisor's Certificate of Excellence for all 8 consecutive years since this award has been given. Spa and Personal Health and Wellness Retreats are also available through A Spa for You: 60, 90 and 120 minute full body massage, specialty spa sessions as well as our exclusive Japanese Facial Massages and specially created 1/2 day and multi day health, wellness and fun retreat experiences are each individually created with care and attention to your needs and desires. Our services are available at our serene West Sedona Spa location, or let us bring the Spa to your suite. Our Nationally Board Certified, Arizona State Licensed massage therapists are available for Sedona's best singles, couples and four-handed massages. When planning a holiday stay in the Sedona area, for greatest flexibility and for us to best meet your scheduling needs, we suggest making your spa reservations as far in advance as possible. Please keep in mind our Sedona Heart Space Special Discounts when considering your reservations possibilities. 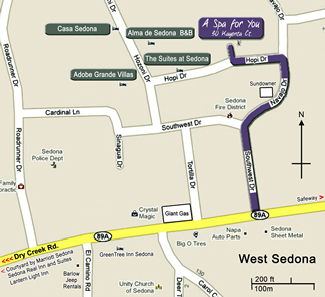 A Spa for You Sedona Day Spa Gift Certificates are available in any denomination*. Please call or email to purchase and have your gift certificate sent to you, your loved one, or have on file for a spa reservation. Please mention any gift certificates you intend to use when making your reservations. A Spa for You Gift Certificates are acepted for all services and product payments. A Spa for You No Longer accepts SpaFinder or SpaWeek gift certificates. As we encourage you to take part in creating and informing us exactly how you like your session - please feel free at any time during or after your session to tell us how we can make it even better. It is our intention to make each session, for each guest, just as you would want it to be - perfect. Sun Cliff Sedona Casita - possibly Sedona's most exclusive, most private, single couple or individual's Casita and Experience with possibilities for weddings and other events. The Lantern Light Inn Bed and Breakfast - close, serene &	complete. 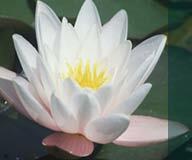 At A Spa For You Sedona Day Spa our most valued gift is the trust granted us by our guests. In our commitment to the health and well being of each of our guests we are pleased to provide you with links to the businesses as well as National, State and Association sites who license, certify and support our massage therapists and business. Heading West on Hwy 89 (after Safeway and before Dry Creek Road) turn right (N.) onto Southwest Drive. Follow right (E.) onto Navaho Drive. Turn left (W.) onto Hopi Drive. Turn right (N.) On to Kayenta Court we're in the first building on your right 30 Kayenta Plaza - 1st floor. Look for Suite #1 and the A Spa For You signs. A Spa For You Sedona Day Spa & Massage may collect personal identifiable information such as your name, email address, mailing address, telephone number and or credit/debit details when you voluntarily submit this information to us in order to make reservations or purchase products. All collected information is held on a confidential basis by A Spa For You. Such information is never shared with any third parties. All online and or electronically swiped credit/debit card information is handled directly by Authorize.net financial gateway services. Any credit card or other financial information that is otherwise shared with us by our customers is properly disposed of after its use.